Whether the landscapes that they create are in oil or pastel, bronze or marble, song or symphony, great artists are born, but great artisans are nurtured. Far more plentiful are significant artists and impeccably-trained artisans than those remarkable creatures in whom exceptional natural ability and acquired refinement are combined. One admires the temperament that explodes from a Goya canvas whilst appreciating the technique that maintains the decorous equilibrium of a scene by Velázquez, but the controlled chaos of a work like Pablo Picasso’s Guernica displays a command of form that coincides with an astonishing interpretive depth. The foundation established by the former attribute allows the latter quality to be honed to the greatest extent permitted by the artist’s imagination. In music, the profundity of Bach’s and Mozart’s humanistic insights are so easily perceived by even the casual listener owing to the extraordinary, almost mathematical equilibrium of their compositions. In that vein, the artistry of pianist Beth Levin possesses both the unteachable gift for solving music’s emotional riddles and the technical accomplishment required to present those solutions in a manner that enables listeners of all levels of musical sophistication to feel as though we, too, have discovered music’s innermost secrets. 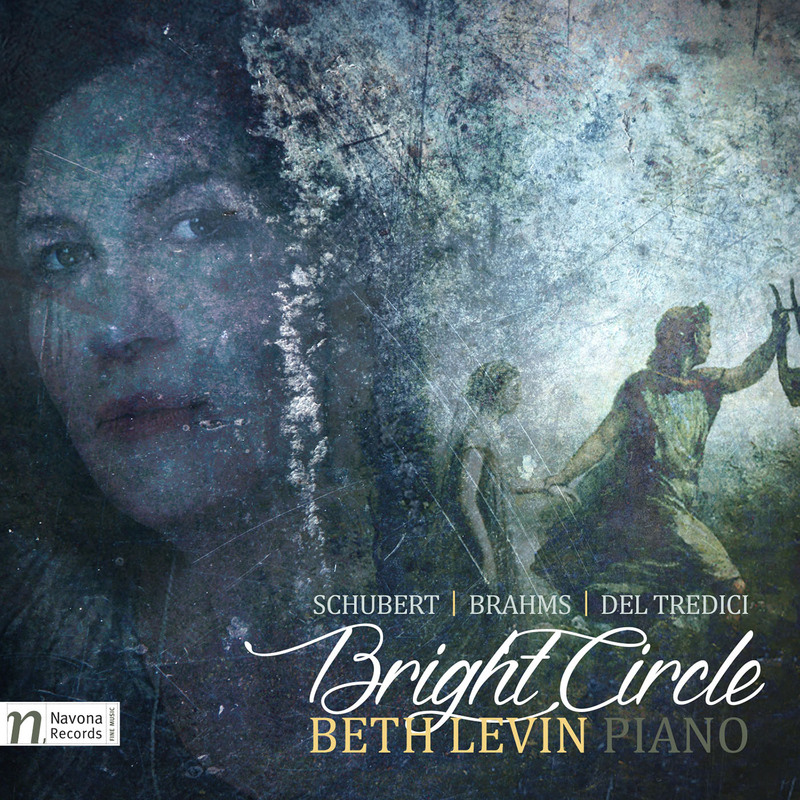 Playing music by Franz Schubert, Johannes Brahms, and David Del Tredici, Levin ignites the blank canvas of her new Navona Records disc Bright Circle with mesmerizing landscapes that metamorphose the sounds of the composers’ music into visual and tactile sensations that transport the listener into the resplendent core of her singular artistic sphere. Schubert’s Piano Sonata No. 20 in A major (D.959), one of the three remarkable final sonatas with which he fully explored the breadth of his genius for writing for the piano, was likely completed in its final form in September 1828, only two months before the young composer’s death. Contemporary accounts suggest that Schubert was a sensitive but imperfect pianist, a characterization that seems strange to the modern observer acquainted with the formidable demands of his mature music for the piano. Perhaps his mastery of the instrument was incomplete, but the A-major Sonata confirms that his understanding of composing for the piano equaled Beethoven’s and Chopin’s. The complex thematic development of the Sonata’s opening Allegro movement is steered by modulations through a traditional circle of fourths, evoking the ‘bright circle’ of the disc’s title, and Levin plays the music with impressive technical acumen. In music from the last year of Schubert’s life, virtuosity is never a piece’s sole destination, however, and Levin is uncommonly clear-sighted in navigating the Sonata’s labyrinthian emotional byways. This is not melancholy music of a man anticipating death: in this music, Schubert clings passionately to life. The rhythmic tautness of Levin’s playing, consistent but never constricting, ideally serves the movement’s innate buoyancy. Some pianists bloat this music by trying to generate profundity where it already exists, but this pianist focuses on following the emotional threads that Schubert wove into the score. Recalling the basic structure of the haunting Lied ‘Pilgerweise,’ the Sonata’s Andantino movement is steeped in a poised tranquility that, as realized in this performance, is subtly disquieting. Levin phrases with a great Lieder singer’s intuitive handling of melodic lines, and she highlights the nuances of Schubert’s harmonic progressions with the skill of an expert organist emphasizing the inner voices of Bach counterpoint. To the Allegro vivace Scherzo the pianist brings a renewed commitment to finding within the composer’s carefully-constructed score the sentiments that Schubert wished to convey. Here and in the Allegretto Rondo final movement, its thematic profile bringing to mind the Lied ‘Im Frühling,’ Levin veritably transforms the piano into a full orchestra, extracting from both music and instrument an arresting array of colors. Still, even when her playing is most boldly extroverted, this is not a performance of the Sonata for the coldly cavernous expanse of a concert hall. Rather, the listener is given the gift of experiencing what seems like a private conversation with Schubert. The creatively-manipulated formal architecture of the Sonata provided the composer a framework within which he fabricated an intriguingly personal tonal narrative, and Levin’s retelling of it utilizes the inherent formality of the Sonata’s skeleton as a vividly-contrasted backdrop for the adventurous musical discourse. Many of the most celebrated pianists of the past century have recorded and included the D.959 Sonata in their recital repertories, but not even renowned interpreters of Schubert’s piano music such as Alfred Brendel and Mitsuko Uchida have exposed the authentic voice of Schubert as compellingly as Levin does in the performance on this disc. A noted champion of contemporary music, Levin finds in American composer David Del Tredici’s Ode to Music an ideal outlet for her unique talents. A reworking of an earlier adaptation of Schubert’s touching Lied ‘An die Musik’ for wind quintet, Ode to Music develops the principal subject of ‘An die Musik’ after the manner of Schubert’s brilliant Wanderer-Fantasie, with, as Del Tredici indicates in his description of the piece, Lisztian and Wagnerian pretensions. Taking both performer and listener on a magical journey in eleven-and-a-half minutes, Del Tredici’s writing marvelously intertwines with Schubert’s familiar melody, the younger composer’s work exhibiting Ralph Vaughan Williams’s aptitude for assimilating existing thematic material into his own original music. Levin’s heart is clearly as captivated by Ode to Music as her fingers are energized by it. As she plays the piece, the listener immediately shares her enthusiasm. Schubert’s A-major Sonata is the work of a youthful composer at the height of his powers but already at the end of his foreshortened career, but Brahms’s Opus 24 Variations and Fugue on the Air from Georg Friedrich Händel’s 1733 Suite for Harpsichord in B♭ major (HWV 434), completed in September 1861, are the product of a still-young genius in the morning of an extensive tenure as one of the greatest guardians of genuine musical Classicism. Dedicated to Clara Schumann, the muse of the first phase of his career, the twenty-five variations and concluding fugue constitute the zenith of Brahms’s writing for solo piano, an instrument for which he also wrote superlative concerti and chamber music. Bach and Händel bequeathed the basic musical forms of Classicism to Haydn and Mozart, who perfected and passed them on to Beethoven, Schubert, and Schumann, but it was often the conservatively revolutionary Brahms who reaped the most exotic blossoms grown from the old seeds. As Händel’s B♭-major Suite constituted an encyclopedic survey of writing for the keyboard in the first half of the Eighteenth Century, Brahms’s Variations and Fugue advanced the progress of compositional techniques from the Nineteenth Century into the Twentieth. What Levin achieves in her performance of the Variations and Fugue is exemplary. Singling out her playing of any of the Variations for special praise would distract from appreciation of her keenly intelligent approach to the work. Lest her technical prowess be taken for granted, it must be stated that she plays this challenging music with the ease of a promising conservatory student breezing through Hanon exercises. Nevertheless, it is her grasp of the near-miraculous continuity of Brahms’s writing that compels awe. As she proceeds through the Variations, delivering each with uncommon attention to the composer’s tempi and dynamics markings, the propulsive homogeneity with which the composer varied Händel’s theme is stunningly apparent. In Levin’s hands, the Variations and Fugue rightfully assume the monumental scale of a Strauss tone poem or a Mahler symphony. This results not from artificial inflation of the music but from playing it as Brahms wrote it, looking not beyond the score but squarely into it. Levin adheres to Brahms’s direction of ‘ma non più’ in the Larghetto thirteenth Variation without exaggerating the lilting quality of the music. As in her performance of the Schubert Sonata, Levin’s pianism expands the instrument’s timbral spectrum, her playing of Brahms’s music at once recreating the crisp cascading of Händel’s harpsichord and unleashing the full panoply of the Romantic orchestra. Amongst German-speaking composers of the Nineteenth Century, only Beethoven, Mendelssohn, and Bruckner rivaled the contrapuntal acuity that Brahms lavished on the fugue that resolves his Händel variations. The analogy of an accomplished organist playing one of Bach’s fugues is as valid in the context of Levin’s playing of Brahms’s fugue as in that of her traversal of Schubert’s Sonata. She performs this music with the drive of an artist connecting with a fellow genius. Brahms’s score deserves nothing less. The clarity of articulation and gossamer touch at all levels of dynamics that are the hallmarks of her playing on Bright Circle resemble the style of Julius Katchen, but Beth Levin’s artistry mimics no other pianist’s. It has been said, not without cause, that self-made men tend to think too highly of their makers. In an artist, though, originality is incalculably precious, and, though they well knew and loved the music of Haydn, Mozart, and Beethoven, Schubert and Brahms hewed their own paths from the bedrock of Classicism. By pioneering Neoromanticism, Del Tredici has pursued his own course, as well. Closing the bright circle that connects the three dissimilar composers whose music is performed on this disc is Beth Levin, a pianist whose interpretive sincerity affirms C. S. Lewis’s assessment in Mere Christianity of originality among artists. ‘No man who bothers about originality will ever be original,’ he wrote, ‘whereas if you simply try to tell the truth (without caring twopence how often it has been told before) you will, nine times out of ten, become original without ever having noticed it.’ Hearing Bright Circle, failing to notice Beth Levin’s originality, manifested in performances that are works of art as important as the pieces played, is impossible.